Is your spidey sense all atingle this fall? Is that because when you walked out the door this morning, you ran into a spider web, face first? Is there an enormous web stretching across your yard? Doorway? Porch? Or, from the nearest tree to the corner of a barn? A garage? Or the sandbox? It’s not Spiderman. It’s the return of the orb weavers. Every fall, no matter where you are, it seems as if there’s boost in the spider population. That’s because there is! Spiders—more accurately, arachnids—are not insects, though we confuse them as such. They’re part of a large family that includes ticks, mites, harvestmen (often called daddy long-legs) and scorpions. Spiders have four pair or 8 legs; insects have six legs. They have no antennae and two-piece bodies with as many as six silk-spinning structures on the back of their abdomen called spinnerets. They also have eight eyes, so they’re not really known for being attractive creatures. However, farmers and gardeners love them. All spiders are potential predators, preying on grasshoppers, flies, moths, caterpillars, leafhoppers, some bees and ants. Oh, and other spiders! Biologists have found spiders eat more insects than birds and bats, which is a big help for agriculture, especially the spider’s ability to kill crop-damaging insects. Spiders have enemies, too, mostly other spiders. However, assassin bugs and mud dauber wasps, bats, shrews and birds also prey upon spiders. The life cycle for a spider typically lasts a year, though some spiders can live two or three years. Most die within one warm season and leave a brood of spiderlings encased eggs to hatch in early spring. When they hatch, they grow, then molt and cast off their exoskeleton (outer body) for a new larger body, and repeat the process until they mature. As for spider webs, all spiders have silk glands, though not all spiders make webs. 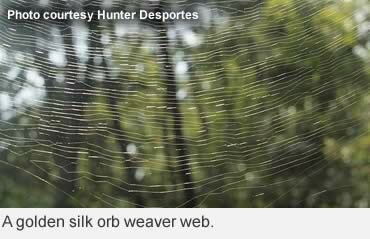 Their webs are made of a liquid protein from inside the spider’s body that hardens when exposed to air. Spider silk is stronger than a thread of steel of the same weight. But just how do they make those huge webs? Garden spiders, or orb weavers put their abdomen in the night air and send silk webbing into the wind until it attaches some distant point. By using that as a highway, they strengthen the first web line several times, before using it as a highway to built the framework of sticky silk. When their framework is in place, they begin a spiral construction, and keep one leg on the previous strand as they build concentric circles. Many orb weavers will build a web a day, and they generally begin their work in the evening, and often build the new web in the same place as the old web. And what about spider bites? Yes, some spiders bite, and some have venomous bites, but the toxicity varies with species of spider. Most spider venom is harmless to humans but may cause irritation or swelling like a mosquito bite. The most harmful commonly encountered spiders are the brown recluse and black widow spiders. Both bites can cause severe pain and infection. The best precaution is to avoid places where you might find a brown recluse or black widow spider, such as dark or damp areas indoors or out, outbuildings, storage units or any place not frequently used. And, if you suspect you’ve been bitten by one, seek medical help. Did you know? Scientists trap spiders in farm fields using giant, but gentle vacuum cleaners. When they figure out what the spiders have been eating, they may find those field spiders have an appetite for a particular crop-destructive pest, such as aphids. That’s when they can make recommendations and help farmers find ways to make their fields more spider friendly. 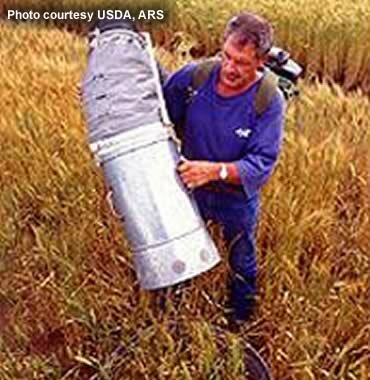 Resources: Missouri Department of Conservation, United States Department of Agriculture—Agricultural Research Service and the Alabama Cooperative Extension Service.